The idea of using barn owls to control rodent populations is an old one. It really started to catch on during the 1950s when farmers in Israel began installing owl boxes around their alfalfa fields. The idea has really taken off with the desire to remove the use of pesticides in food production. In 2002 Jordanian and Israeli farmers searching for a way to stop using toxins for pest control began to work together to use the owls as "biological pesticides." The two countries have placed as many as 2,600 nesting boxes in Israeli fields along the border with Jordan. Since the owls have no awareness of geo-political borders, they serve the farmers in both countries. In addition to the reduction of pesticides being pumped into the environment, the plan also increases barn owl habitat. In the US the use of barn owls is slowly coming into popularity. A 100-acre vineyard near Sloughhouse, California has installed 20 barn owl boxes around three sides of the fields. The boxes, set up to deal with a gopher problem, were free through a grant from the Lodi Winegrape Commission and Pacific Gas and Electric. 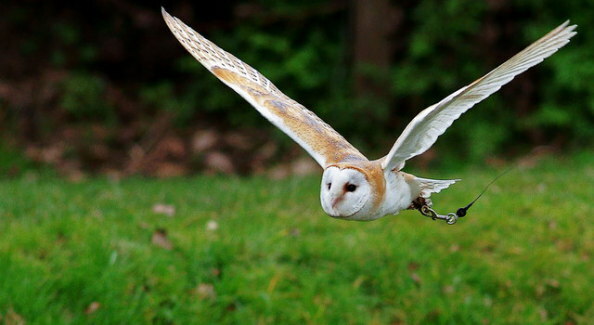 There are several traits that make barn owls the ideal partners in pest control. On a good night, the average barn owl will eat two rodents and will hunt up to two miles from its home, though they prefer to stick closer to home. Unlike other raptors, they are not territorial and will not chase each other away and they tolerate human activity as well. They also have the best hearing of all the different owl species, allowing them to hear rodent activity, even underground. Barn owls are not the ultimate solution for farmers in controlling rodents, but it is one of many possible tools that remove the use of pesticides from the food chain. Go Batty For The Two State Flying Mammals!